Here are some tips that will help you to make healthier choices each day! Eating healthy and nutritious meals on a daily basis is impactful no matter how old you are. Since March is National Nutrition Month, it is important to be aware of what nutrition means. Nutrition is obtaining and consuming food that is necessary for growth and good health. 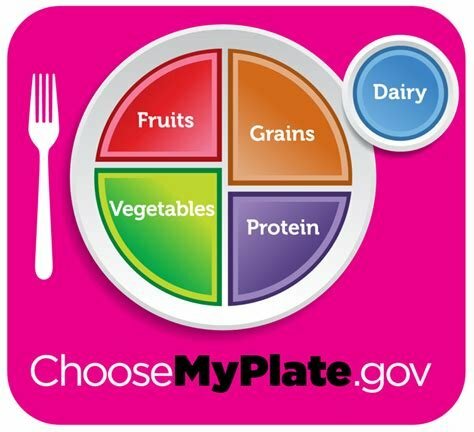 In order to know what type of food you need to have a nutritious and balanced meal, you should take a look at MyPlate. MyPlate is a nutrition guideline which not only helps you to identify what type of food is nutritious, but also helps you distinguish how much food should be consumed in order to have good nutrition. Here is some advice on how to use MyPlate and some easy tips on how to achieve nutrition goals so that you can start National Nutrition Month off to a healthy start! Fruits and vegetables help to reduce the risk for many types of diseases including heart disease, certain types of cancer, obesity and type 2 diabetes. They can also lower your blood pressure, prevent kidney stones and decrease bone loss. Grains can decrease the risk of heart disease and constipation and can even help with managing your weight. When pregnant, it is beneficial to eat grains that are enriched with folate before and during pregnancy because it helps to protect against neural tube defects in a baby. Protein provides many nutrients, including protein, B vitamins (such as niacin, thiamin, riboflavin and B6), vitamin E, iron, zinc and magnesium. Protein also supplies basic units for bones, muscles, cartilage, skin and blood and builds enzymes, hormones and vitamins. Dairy improves bone health and lowers the risk of osteoporosis. It is crucial during childhood to help build strong bone mass and also reduces the risk of cardiovascular disease and type 2 diabetes. In order to reach your nutrition goals, start off by making small changes in your diet. Make changes that are small and simple and will be able to be achieved on a daily basis. Be sure that these changes will help you now and that you continue them in the future. Also, make sure to take these healthy changes a day at a time. It is okay to have cheat days as long as you remind yourself of your goals and how to keep working to get there. It's also important to be active along the journey. Try out new fitness classes or go to the gym to make sure that you are not only eating better but also staying active. To make your health journey a bit more fun, partner up with a friend who has similar goals. Staying on track of your goals is much more fun when you are working on them with someone else. Lastly, make sure that you celebrate all of your successes. Reward yourself for all of the hard work that you put in and make sure to stick with these healthy habits in the future. I hope this article helped you become more knowledgeable about nutrition, MyPlate and how to reach your nutrition goals so that you can make National Nutrition Month your starting point for a healthier and happier well-being!